Users have faced a lot of problems with the released iOS 12/11 upgrades. One of those problems is a filed iCloud Backup. This is a serious concern especially when you consider what failing to have a backup should you experience data loss can be like. If you are one of the many facing this problem, worry not. This article will offer a number of solutions we guarantee will fix the issue for you. It is possible that the lack of adequate storage is causing the issue. In this case, deleting some of the older backups to create room for the new one may work. Here's how to do it. Step 1: Tap on Settings and then iCloud. 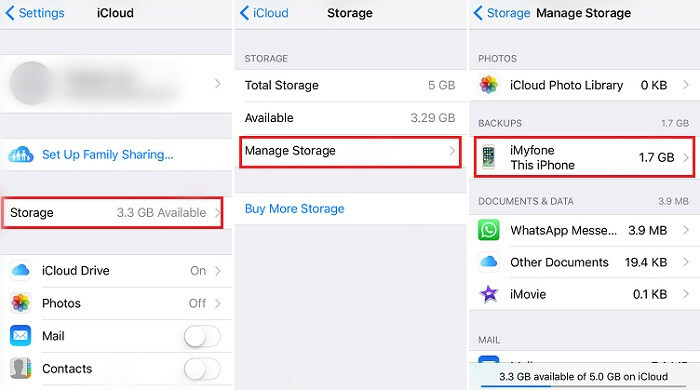 Step 2: Then, go to Storage and tap on "Manage Storage". Step 3: You should see a list of old backups. Select the one you can delete and then tap "Delete Backup". If it is not a storage problem, simply signing out and then signing back in has been known to do the trick. It's a simple, yet effective solution. Try it before resorting to more specialized solutions. Because backing up your device to iCloud often requires a Wi-Fi network, network problems may be to blame. In this case, resetting the network settings may fix the problem. Here's how to do it. Step 1: Tap on Setting and then Select "General". Step 2: Scroll down to find "Reset." Tap on it and then tap "Reset Network Settings". Step 3: Enter your passcode to confirm. Just as effective as iCloud, iTunes allows you to back up all the data on your device. Follow these simple steps to do it. Step 1: Launch iTunes and connect the device to your computer. When asked to "Trust this Computer" follow the instructions on the screen. Step 2: When the iPhone appears in iTunes, select it and then click "Back Up Now" and wait for the process to be completed. Keep the device connected to the computer until the process is complete. 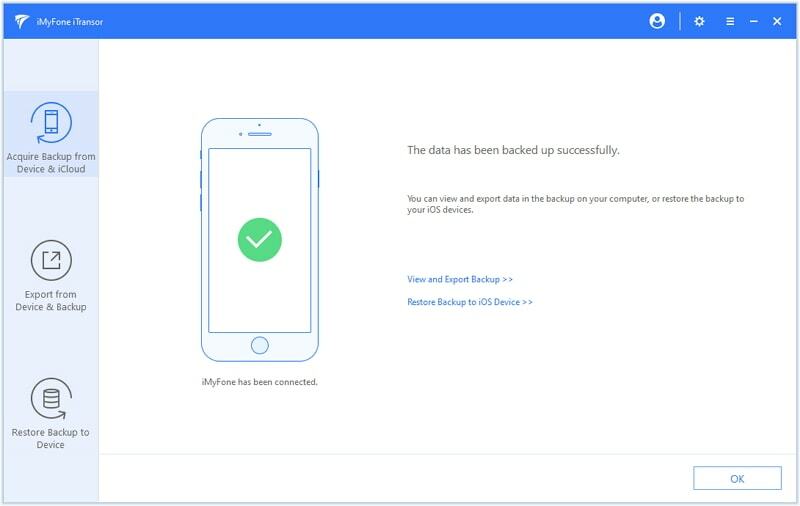 Another way to Back up your iPhone is to use iMyFone iTransor (renamed from D-Port Pro), a backup and restore tool that makes the process easy and more flexible. 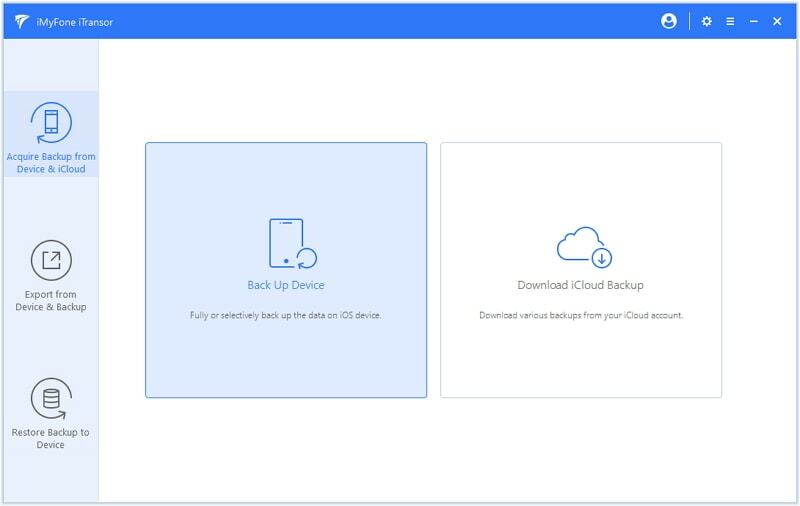 This tool allows you to selectively backup certain types of data and also restore a partial backup to your device. It is also ideal when you need to export data from an iCloud or iTunes backup. Fully or selectively back up iPhone without overwriting previous backup. 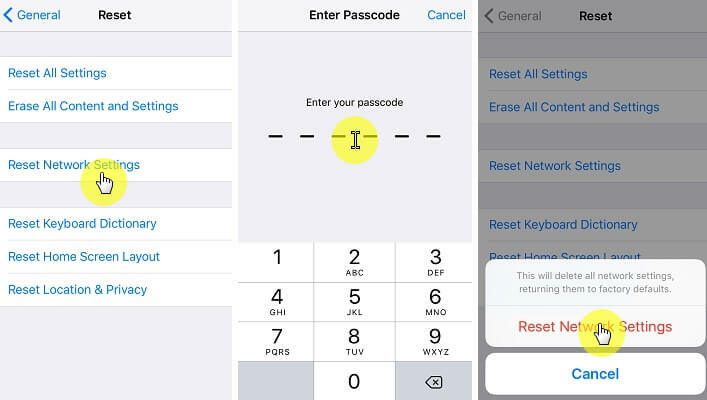 Restore a full backup, or only restore WeChat, WhatsApp, Contacts or Messages to your device. 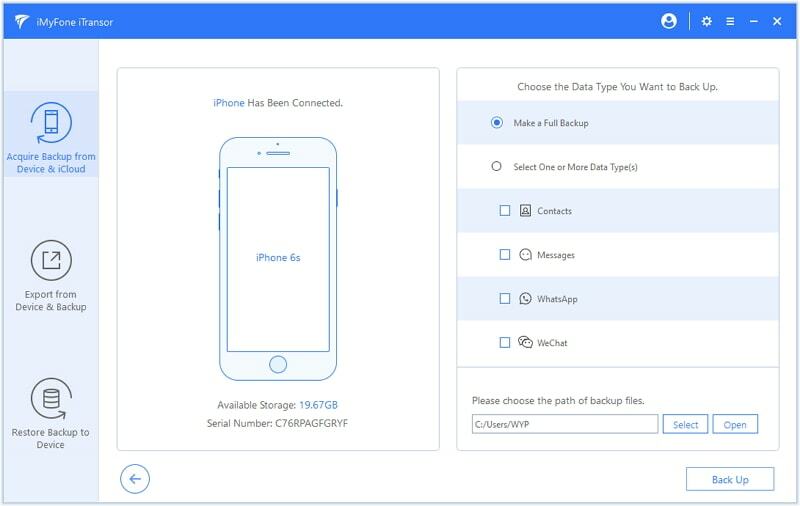 View and extract 20+ types of data from the backups, like WhatsApp/WeChat/Kik data, messages, photos, etc. "Merge" and "Replace" functions for both fully restore and partially restore. 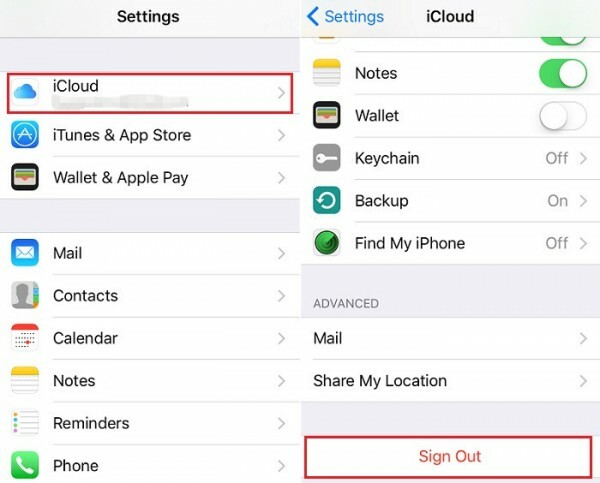 Download and install iTransor to your computer and then follow these simple steps to create a backup of your iPhone. 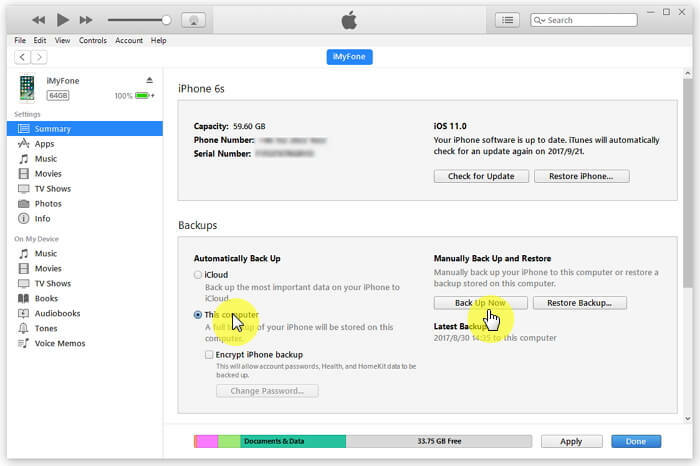 Step 1: On the main window of the program, select "Acquire Backup from Device & iCloud" and the click "Back Up Device". Step 2: Connect your device to computer in the next window and then choose "Make a Full Backup". After setting the wanted path for your backup file, click "Back Up" button to proceed.